In amongst all the doom and gloom of the British pottery industry recently, it’s heartening to know that there is at least one company out there that is doing well – and even making a profit! Emma Bridgewater founded her eponymous pottery in the mid-1980s and makes unmistakeably English – and cheerful – tablewares. Last year, the company turned over £7.5m and made a 5% profit – while companies such as Wedgwood and Denby Pottery were losing money hand over fist. Emma Bridgewater and her husband and business partner Matthew Rice were recently interviewed in the Financial Times. They reckon their cheerful, bright wares are comforting to have around and that the worse time for them is “coming out of a recession” – when people want “clean, modern lines”. Click here to read the FT’s article in full. This entry was posted in English Potteries and tagged British pottery, Emma Bridgewater on February 27, 2009 by Perfect Pieces. Cornishware has always been a very popular collecting area – perhaps because it has always been usable, quite affordable and because it has a colourful, informal style that fits well in many modern homes. Until recently, another attraction of Cornishware was that it was still being made – so collectors could mix and match new and old pieces if they wanted. Unfortunately, that’s not the case anymore. The original T.G. Green pottery at Church Gresley had gone bust long ago, but the company had been resurrected more recently under new ownership and continued to produce pottery in the same, distinctive striped style from the same location. This company too has now ceased trading. 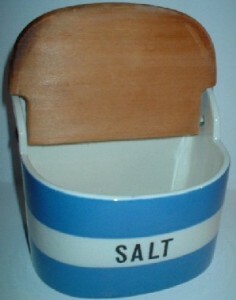 According to the thoroughly excellent www.cornishware.biz site the T.G. Green factory in Church Gresley ceased trading and went into administration in July 2007, ending another era in British pottery. If you are looking for information about Cornishware, I’d highly recommend www.cornishware.biz – it’s a specialist site with a huge range of stock and lots of good information, including a comprehensive set of backstamps. This entry was posted in English Potteries and tagged Church Gresley, Cornish Blue, Cornishware, TG Green on June 20, 2008 by Perfect Pieces. Thirty jobs are to be cut at the Royal Crown Derby factory in Osmaston Road, Derby. The announcement was made to the company’s 230 staf by chief executive Hugh Gibson, who said the cuts were necessary for the company to survive. Royal Crown Derby blamed the job cuts on the slowing UK economy, which has resulted in falling demand for its products. This entry was posted in English Potteries and tagged Crown Derby, Derby, English Potteries, job cuts, Royal Crown Derby on June 17, 2008 by Perfect Pieces. There seems no sign that the exodus of volume pottery manufacturing from the UK is slowing. According to a recent press release by market research company Research and Markets, the total value of manufacturing sales of ceramics in the UK between 2002 and 2005 dropped by 32% – almost a third. At the same time, the total retail value of ceramics sold in the UK remained almost unchanged. That extra third must have been produced somewhere, though, musn’t it? Even the industry’s most famous names are experiencing problems at the moment – with both Wedgwood and Spode in the middle of job-cutting reorganisations aimed at helping them return to profitability. In addition, the past year has seen the failure of both Poole Pottery and Royal Stafford, as well as the offshoring of most PenDelfin production. All of this leaves you wondering what the future will hold for the nation’s world-famous potteries. I firmly believe that the only possible answer lies in quality, originality and technical innovation – rehashing old designs and shapes and launching tawdry “celebrity-endorsed” ranges of tableware can only take companies so far. They have to do something to justify the higher costs of designing and manufacturing pottery in the UK – and true innovation seems the only answer. On the other hand, perhaps the demand that used to exist at the top end of the market has simply passed – a victim of changing fashions and lifestyles. I don’t know – what do you think? This entry was posted in English Potteries and tagged English Potteries, offshore, Pottery on June 13, 2007 by Perfect Pieces.